The Calgary Flames had a disappointing season in 2017-18, finishing 11 points outside of the post-season mix. Given that disappointment, the Flames have made several roster changes during their off-season. There may be even more roster turnover, given that they have a few young faces pushing for National Hockey League jobs. A handful of prospects in particular have made strides towards big-league gigs. Here’s a look at the three Flames prospects with the best chances of supplanting a veteran and cracking the opening night roster. One of two Flames picks in the second round of the 2016 NHL Draft, Dillon Dube has established himself as a superb Western Hockey League player. When he was drafted, the thought process was that Dube would need to find his way into the NHL in an offensive, top-six role in order to be successful. However, Dube turned a lot of heads with his agitating, shutdown role on Team Canada’s fourth line at the 2017 World Juniors. He followed that up with a starring role as captain on Canada’s 2018 World Junior squad, suggesting that he has more paths to the big leagues than originally thought. He impressed at Flames camp in 2017 and could make the squad as a fourth line energy winger – playing behind Johnny Gaudreau, Matthew Tkachuk and Sam Bennett on the left side – and as a penalty-killing option. Arguably the top prize of the 2017 college free agent class, Spencer Foo left Union College and signed with the Flames rather than his hometown Edmonton Oilers. He spent the bulk of the 2017-18 season in the American Hockey League with the Stockton Heat and really got his game going in the second half. He was one of the few bright spots on the NHL roster late in the season, scoring twice in four games during a late call-up. Foo’s ascent to the Flames roster is stymied a bit by the number of right shot forwards they’ve added this summer, as there’s no obvious spot for him to slot into. Compared to Dube, Foo’s path to the Flames is a bit narrower as he’s primarily an offensive forward and his checking game is still a work in progress. That said, he could adapt into a bottom six role during the pre-season and potentially could provide the Flames with another potent right shot option for their power play. The Flames’ first round selection in the 2017 NHL Draft, Juuso Valimaki is turning pro after three strong seasons with the WHL’s Tri-City Americans. The 19-year-old is a great skater, a physical beast, and a point-per-game player in the WHL as a defenseman. He’s mature enough and good enough to challenge for an NHL gig, but the challenge for him will be supplanting a veteran. While the Flames have a well-established top four group with Mark Giordano, TJ Brodie, Noah Hanifin and Travis Hamonic, there’s the potential for Valimaki to earn a job as a third pairing defender and spent a season playing sheltered minutes alongside Michael Stone. 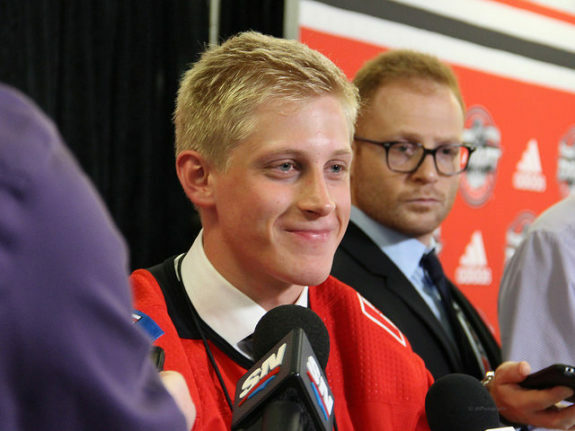 Valimaki has more offensive upside than Brett Kulak, currently the Flames’ third pairing lefty, but he’ll need to prove that his defensive game is up to snuff. Dube is probably the most likely of the three players mentioned to crack the Flames’ roster. While adding Foo or Valimaki would involve some lineup shuffling, and potentially losing a player on the waiver wire, Dube’s competing with the likes of Curtis Lazar and Garnet Hathaway for bottom six duty and so the stakes are comparatively lower than for the others. That said, there’s the strong likelihood that all three of these players see some NHL time during the upcoming season. Injuries always happen and strong depth is a big asset for any organization.